As I was looking to use up some canned puree leftover after making pumpkin truffles, I stumbled upon a recipe for chocolate chip squares. Although I was searching for a pumpkin cake recipe, the bar recipe caught my eye so I decided to try and make a low carb version. The recipe was on the Martha Stewart site. I’ve actually been a fan of Martha’s for a long time and was fortunate to get tickets to see her live in NYC back in 2005 during the first week of filming her new show. 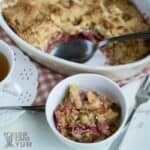 It wasn’t very difficult to adapt the original recipe to one that’s keto friendly. 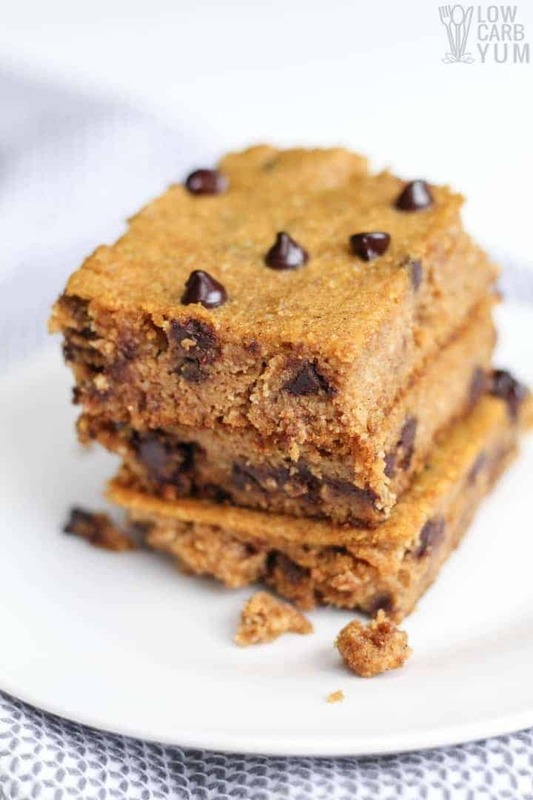 In fact, it wasn’t difficult to adapt the recipe to make low carb gluten free pumpkin bars with chocolate chips. The original recipe calls for two cups of regular wheat flour. From my experience in low carb baking, the best flour replacement is a combination of both almond and coconut flours. The ideal ratio is 3-4 parts almond flour to one part coconut flour. Therefore, I tried using 1.5 cups of almond flour and 0.5 cup of coconut flour to replace the all-purpose flour. I also added a little xanthan gum to reduce crumbling that can occur without gluten. The results on the first batch came out so well that I didn’t bother testing with a different flour ratio. 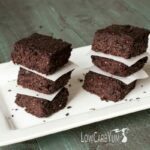 I could have made other changes to use all coconut flour or even tried using just almond flour without any other changes. I do prefer all coconut flour and I may try to tweak the recipe again for that. In order to make it work, I’d have to use less flour and add in a bit more egg and liquid. Usually a few tests are required to convert to a recipe using only coconut flour. 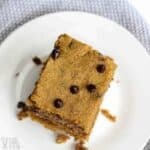 If you want to cut back carbs further, the chocolate chips in these gluten free pumpkin bars can be omitted. 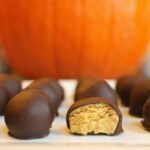 However, I find the combination of pumpkin and chocolate is tastes much better. 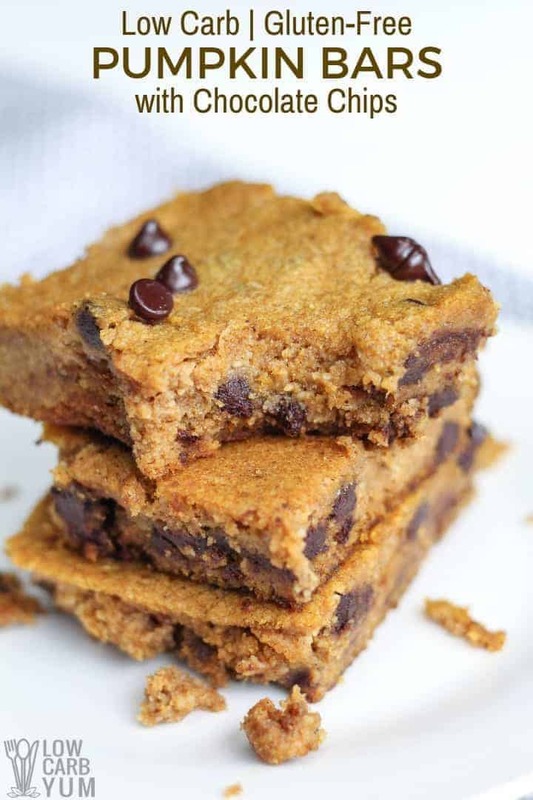 The ingredients needed to make the recipe are: butter, low carb sweetener, eggs, vanilla extract, pumpkin puree, almond flour, coconut flour, baking soda, salt, cinnamon, ginger, nutmeg, allspice, ground cloves, xanthan gum, and low carb chocolate chips. To make the bars, first the butter and half the sweetener are creamed together (photos 1 & 2). The eggs and vanilla are beaten in next (photos 3 & 4) then the pumpkin puree is mixed in (photos 5 & 6). 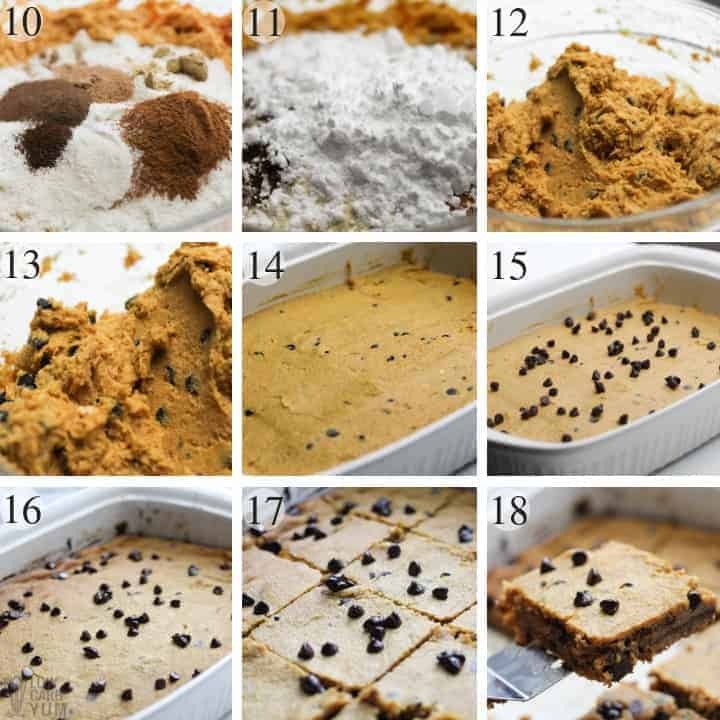 The rest of the ingredients are then stirred in (photos 7-13) with the exception of a handful of chocolate chips to sprinkle on top before baking. The batter is then spread into a 9×13-inch pan (photo 14), the reserved chips are sprinkled on top (photo 15), and then it’s baked for 30-35 minutes at 350°F. When done, the top of the bars with be a nice golden brown (photo 16). Once cooled slightly, the bars are cut into squares and enjoyed (photos 17 & 18). What kind of low carb chocolate chips? 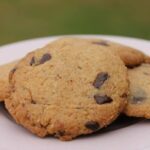 For convenience, I used Lily’s stevia sweetened chocolate baking chips. Although you can use the whole 9 ounce bag, it adds a lot of unnecessary carbs. I did a quick measure and the amount in the bag was about 1 ¾ cups of chocolate chips. I recommend using only a half bag of Lily’s chocolate chips to cut back on carbs and cost. Therefore the recipe calls for 4½ ounces of chocolate chips. 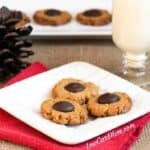 To save even more money, you can make your own sugar free low carb chocolate chips. I use my own homemade chocolate recipe and pour it into a baking pan to cool. Then, I just cut the big hunk of chocolate into bits. This recipe makes a dozen large bars. If making for a large group or to cut down on calories, they could be cut into smaller squares. Very dense and moist, these delicious pumpkin bars are hard to resist. If you leave out the chocolate chips, a chocolate ganache could be drizzled on top instead. I’ve got a great recipe for ganache in my low carb peanut butter cheesecake recipe. You can even leave the chocolate out all together and drizzle with a simple mix of cream cheese, cream, and powdered sweetener. Or, try frosting them with the same cream cheese icing I used in my other low carb pumpkin bars. 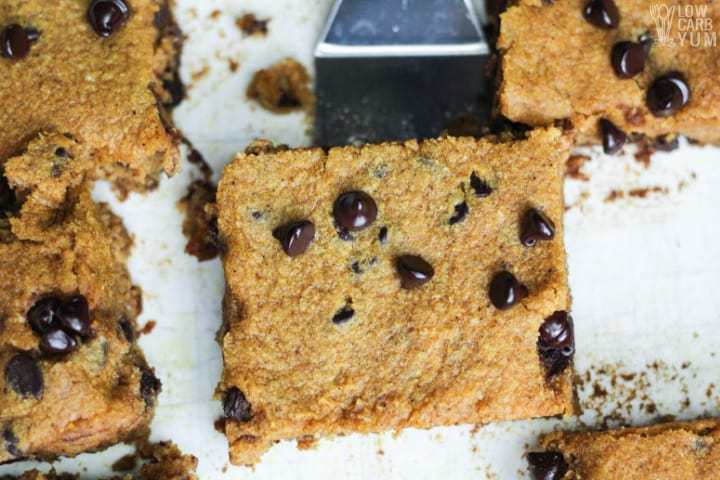 We hope you enjoy these delicious and easy to make pumpkin cookie bars with chocolate chips. If you give the recipe a try, be sure to let us know what you think in the comment section below. 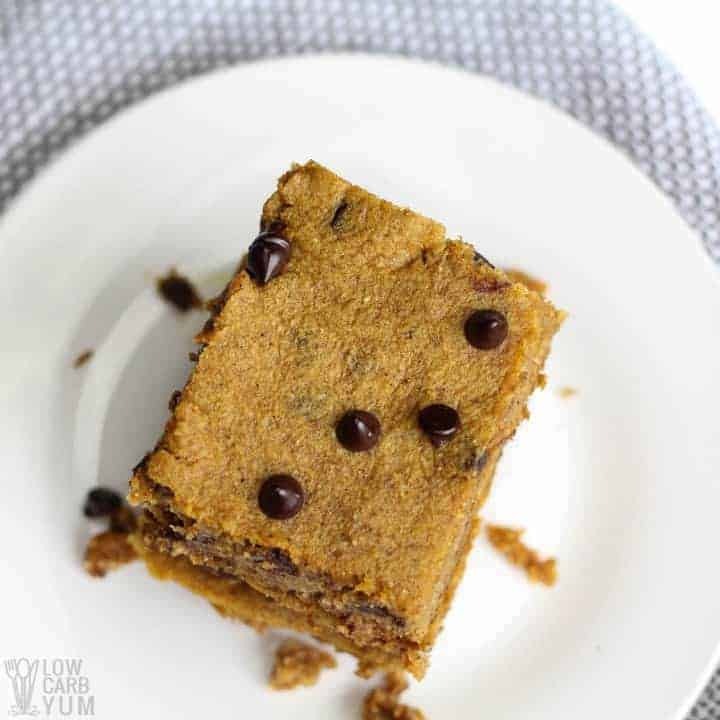 Dense low carb pumpkin bars loaded with sugar free chocolate chips. Super easy recipe that is quick to prepare. Preheat oven to 350 degrees Grease or line 9x13 baking pan. In large mixing bowl, cream the butter and half the sweetener together. Then beat in egg and vanilla. Add the pumpkin an mix well. 6 grams net carbs per bar. Originally, 1.5 cups of sweetener was used, but it seemed too sweet so it was cut back to 1 cup. Additional sweetener can be added if desired. 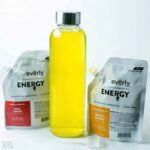 You can also use 1/2 cup of granular low carb sweetener and 1 teaspoon of either liquid monk fruit or liquid stevia to reduce the erythritol. The recipe yields a dozen large bars. They could be cut into smaller squares to reduce carbs and yield more. A chocolate ganache could be drizzled on top instead of the chips. The recipe we suggest is in the low carb peanut butter cheesecake recipe. If the chocolate is left out, a drizzle made with cream cheese, cream, and powdered sweetener could be used. 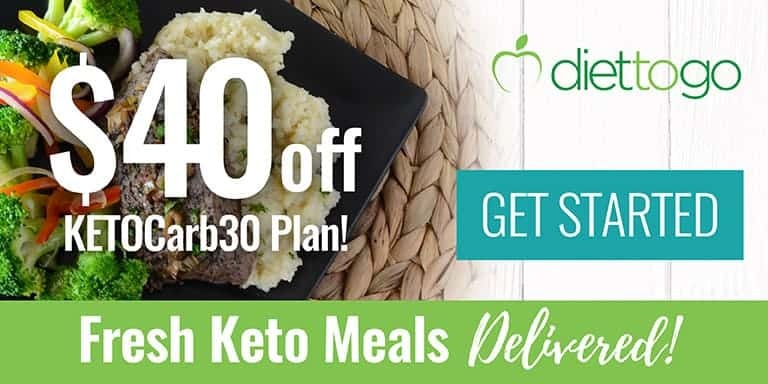 Another option is to frost them with the same cream cheese icing used in the low carb pumpkin bars recipe. Post updated in October 2018. Originally published November 2014. As I read through the comments, it looks like the sweetner linked may have changed a few times. I see Pyure mentioned (original link? ), then Swerve, and now it links to monkfruit sweetner. I had Pyure and cut it to 1/2 cup total, since it’s supposed to be 2 x as sweet as other sweetners. I also cut it into 32 mini bars for Thanksgiving. Going to count it as 2 net carbs. Any sweetener can be used. I’ve gone through several sweeteners over the years. Originally I used Pyure (which I still love), then I tried Swerve (which I don’t really care for due to a weird taste), finally monk fruit has won me over. But you can use whatever sweetener you prefer in most of my recipes, including this one. Ahhhhhh!!!!! Just put them in the oven, glanced over at the bag of almond flour to my horror it was psyllium husk powder. Oh well, just going to wait and see. These are fantastic!! It’s been forever since I’ve had something rich and cakey, and these will do beautifully! I used unsweetened carob chips because that’s what I had, and a combination of inulin and Stevia. Thank you for the recipe!! Do you have suggestions for a nondairy replacement for the butter? Thanks! I like to use butter flavored coconut oil. I really want to try out this recipe but anytime I bake using Swerve, the baked product has a granular sugar gritty feel. Its like the sugar does not dissolve. Have you had this issue in your baking? Do you have any recommendations on how to correct it? I only have that issue if there’s too much sweetener added. And I didn’t have that issue with these bars. You can always lessen the amount of granular sweetener and replace with a concentrated sweetener. Any grittiness is due to erythritol. Is the swerve the confection or granular? The link brings you to the bundle. You can use either. I used the regular Swerve. You could try adding more pumpkin and sweetener. Hi there my niece has a nut allergy, is it possible to use more coconut flour in place of almond? You’d need to make other changes to do that. 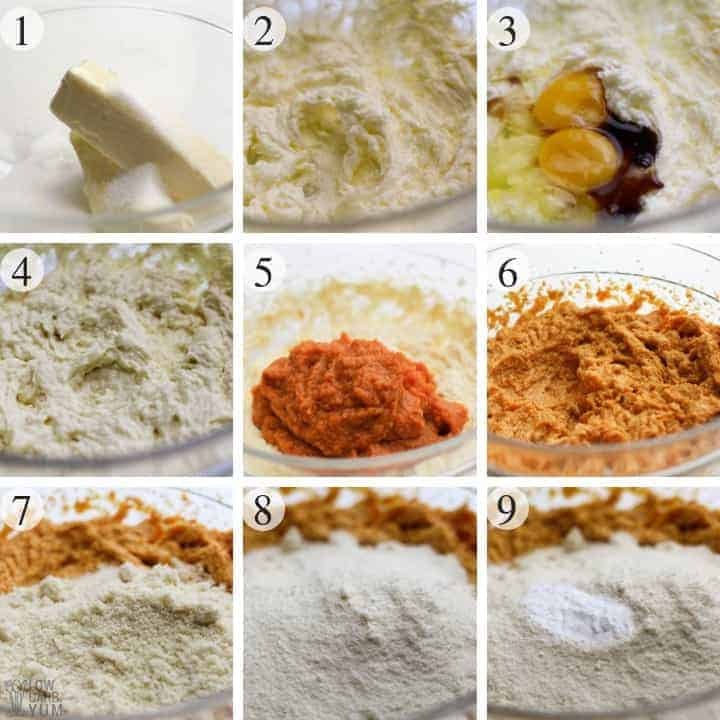 However, you could replace the almond flour with finely ground sunflower seeds and the amount would be the same. Will any stevia work in place of the Pyure? You can use any sweetener. Just keep in mind that Pyure is twice as sweet as sugar so you’ll have to convert accordingly (use twice as much of a one-for-one sugar replacement). 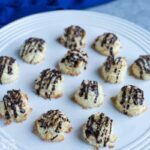 Just made these – they turned out really crumbly and poofy – is this normal? I’m not really sure if they’re fully cooked, so I might have underbaked them – the edges were firm and starting to char a little. Any opinions on it would be nice! I’m hoping it firms up a bit when it’s fully cooled. If they came out crumbly, you may have needed another egg and maybe some xanthan gum. They should firm up once cooled. 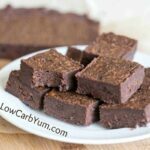 Like most low carb baked goods, they are much better the next day after being in the refrigerator the next day. I’m quite surprised that this recipe has 37.5 carbs per bar! 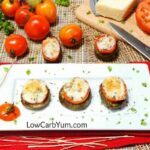 How is the a low-carb recipe?? 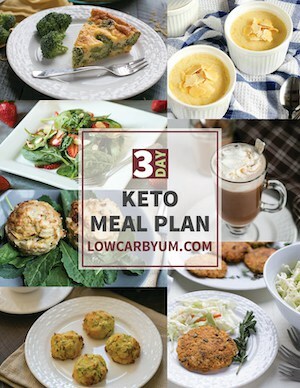 I’ve reviewed the ingredients and I’m not seeing where the carb count is coming from? There seems to have been a mistake in the calculation from the software I was using and also noticed a significant amount of carbs from the chocolate chips. I recalculated and got only 8g net carbs per blondie after correcting the mistake along with using only half bag of chocolate chips. The original recipe had way more chips than is needed. I updated the nutrition information in the recipe to reflect the changes. Thanks for catching the mistake! REALLY enjoyed this recipe. I can not even have chocolate and it was still so so good. Thank you. Without the chocolate carbs are lower so I’ll have to try it that way. Thanks for letting us know!